Even before the end of World War II, German General Erwin Rommel’s fame was such that he was already being elevated into the Valhalla of such legendary warriors as Hannibal against the Roman Empire, Napoleon during his defensive campaigns of 1813-1814, and Robert E. Lee throughout the American Civil War. Despite the fact that all four “Great Captains” were—in the final analysis—losers, they have loomed far larger in the public mind than those who defeated them. Thus it was that, with Erwin Rommel as well, myth became legend and legend became fact. Charismatic, dashing, and colorful, Erwin Rommel burst onto the scene in the public consciousness in the spring of 1941 when his first unexpected offensive in the Western Desert of North Africa sent the formerly victorious British Eighth Army reeling in defeat after a year and a half of triumphs over the hapless Royal Italian Army. According to noted British military expert and author Basil H. Liddell Hart—one of the recognized fathers of mechanized warfare—from 1941 on, Rommel’s name was the most prominent of all German field marshals and generals, reflecting his meteoric and unprecedented ascent from colonel to field marshal. Doubly an outsider, he was not a high-ranking member of the general staff, and all his major victories excepting France in 1940 were outside continental Europe. Rommel was the “sun hero” for his exploits in North Africa and Edouard Dietl, who rose through the ranks from private before the Great War to four-star general in Finland in 1942, was the “snow hero.” Thus Hitler ordered Nazi Propaganda Minister Dr. Josef Goebbels to make Rommel the most enduring Nazi-sponsored hero of World War II. Following Rommel’s forced suicide in 1944, it fell to the victorious Allies to keep alive the spark of the Rommel legend, that of the “good German” who, in the end, had defied the Führer. Thus he found a new life as the patron saint of the West German Bundeswehr (Armed Forces) in 1955 when that force joined the North Atlantic Treaty Organization (NATO), which his own deputy once headed. One man whose career Rommel consciously emulated was T.E. Lawrence (aka Lawrence of Arabia), and it would have been interesting to have seen them pitted against each other had the latter lived long enough. Both desert warriors created their own legends and burnished their images in their wartime writings, much as Julius Caesar and Napoleon had earlier. Erwin Johannes Eugen Rommel was born on November 15, 1891, at Heidenheim, a small town in Württemberg near the city of Ulm. His namesake father was a schoolteacher and mathematician, as was his father before him. His father died in 1913 and his mother in 1940, when her already famous son was a major general commanding a panzer division. Rommel entered the Imperial German Army as an enlisted officer candidate at age 18 in 1910, when his father had opposed his going to work for the Zeppelin works at Friedrichshafen, and thus it was that he served in the ranks before going on to the War Academy. Promoted to corporal that October, he was raised to the rank of sergeant the following December. In March 1911, Rommel was stationed at the War Academy at Danzig in East Prussia. As commander of the 7th Panzer Division, Rommel accepts the surrender of French and British units during the invasion of France, 1940. Having been awarded the highest decoration that Imperial Germany could offer—Frederick the Great’s Pour le Merite or “Blue Max” medal (named after German air ace Lieutenant Max Immelmann), Rommel was retained in the new Republican Army after the fall of the Hohenzollern dynasty and the loss of the war in 1918. He spent the (for him) dreary but personally happy interwar years doing typical garrison duty: drill and training, commanding ever larger units, lecturing at war academies in both Germany and Austria, and honing his skiing abilities as commander of a mountain battalion at Goslar in 1935. It was there that he had a chance but fateful encounter with the new chancellor of the German Reich, Adolf Hitler. When Lt. Col. Rommel was informed that a line of the Führer’s elite SS Leibstandarte Adolf Hitler troops would stand between his own men and Hitler at a formation, he asserted that, in such a case, his men would not parade. Hitler got the message and took note of this forceful officer. This first positive impression was reinforced in 1937 with the publication of instructor Rommel’s book, Infantry in the Attack, which was adopted by the Swiss Army as a training manual. Hitler read the book as well and again noted the identity of its author. Three times—in October 1938 and in March and September 1939—the Führer personally selected Rommel to head his military bodyguard unit as he entered the Sudetenland, Czechoslovakia, and Poland in quick succession. 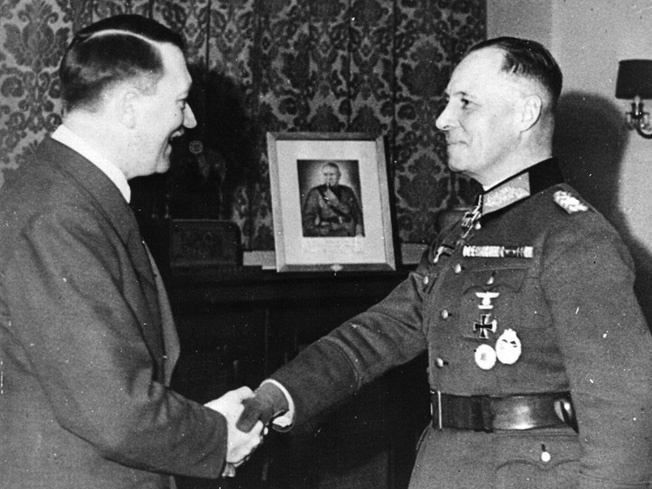 Hitler congratulates Rommel during the awarding of Oak Leaves to go with his Knight’s Cross, March 20, 1942—before Rommel fell out of favor with Hitler. From his unique vantage point aboard Hitler’s special command train, codenamed Amerika (later changed to Brandenburg), Rommel had a bird’s-eye view from which to observe the new field technique of Blitzkrieg (lightning war). At the conclusion of the campaign, when Hitler asked him what he wanted to do next, Rommel boldly asked for command of an armored division in the coming campaign against the Western Allies, although all of his previous 29 years had been spent first in the infantry and then in the Alpenkorps. He was given the 7th Panzer Division, relieving General Georg von Stumme, who would, in late 1942, replace him briefly during the Second Battle of El Alamein. He took command on February 15, 1940, and went into action at the head of his troops on May 10 when the Germans invaded Belgium, Holland, Luxembourg, and France in a six-week-long campaign that defeated all of them and sent the British Expeditionary Force fleeing back to England from Dunkirk. Rommel’s own part in all of this earned his division the nickname of “Ghost Division ” for its rapid and historic swift advances. T.E. Lawrence had seen desert warfare akin to that of the sea, with his light, mobile forces striking when, where, and how they pleased. In France Rommel employed the same concept with his armored units, telling his men, “We’ll do it like the Navy,” firing their tanks’ guns left and right as they advanced into the rear of the demoralized enemy, all the while constantly moving, gaining ground, and producing a stunning, shattering, psychological effect on the defeated foe. He replicated these tactics in the Western Desert when he was posted there by Hitler in February 1941 to aid the retreating legions of Italian Fascist Leader Benito Mussolini in what was intended to be merely a supporting role. Rommel proved himself to be the ultimate independent commander once he arrived at Tripoli in Italian Libya, however, and immediately launched an attack that caught the British Army of the Nile completely by surprise. From the start, the new commander of the Afrika Korps—later expanded to Panzer Army Africa and then to Panzer Group Africa—operated under several daunting handicaps. First, he was nominally under the command of the Comando Supremo (Supreme Command) in Rome, as well as under the Italians on the spot and under his own German superiors at Hitler’s headquarters in far-off East Prussia. Next, despite the presence of the battle-hardened Luftwaffe, he was always outnumbered in the air by the Royal Air Force and, during late 1942-May 1943, by the Americans as well. The British air and naval presence on the island of Malta  bedeviled his supply efforts  throughout his desert campaigns, and the high command of the German armed forces never gave his theater priority until after the American invasion of North Africa in November 1942 . By then it was too late, as he had already been defeated by the British Eighth Army in the Second Battle of El Alamein. Desert warfare was by definition mobile fighting , making tanks top priority and infantry of little actual use other than as garrison troops doing occupation duty. When retreating, Rommel always opted to transport his German forces first, leaving the Italians behind to walk. By the time he was beaten by British Eighth Army commander General Bernard Law Montgomery at the Second Battle of El Alamein  in November 1942, Rommel was a sick man and worn out physically, having attempted too much and punished his body mightily in more than two years of exhausting, grueling desert warfare. Prior to the battle, he returned to Germany for a period of rest and recuperation, then was asked to go back to North Africa when his replacement in command—General Georg von Stumme, from whom he had taken the 7th Panzer Division in 1940—was discovered to be missing and later found dead of a heart attack. By then, Rommel was suffering from severe headaches, overstrained nerves, and poor blood circulation and was taking prescribed sleeping pills. He lost the battle that he had already planned and was recalled from Tunisia before the Axis forces surrendered there on May 12, 1943. The following September, Rommel had his appendix removed in an emergency procedure after experiencing sharp stomach pains. Critics such as his later boss in Normandy, Field Marshal Gerd von Rundstedt , stated that, while he was a good division commander, Rommel was not really suited to higher command because of his failure to stay in touch with his headquarters. His practice of leading from the front—while making excellent copy material for the weekly newsreels back home in the Third Reich—was in reality a confusing method of command. Indeed, he often took his chief of staff with him in his command car while careening about in the desert instead of leaving him at headquarters where he might have done some good. Other critics have also maintained that, while he was a tactical genius of the first rank, he was no strategist, but this argument falls flat when one reads his writings as found in the postwar The Rommel Papers. This reveals that, while he disagreed with Hitler’s total fixation with the far larger Russian Eastern Front, he was not lacking in the ability to see the larger picture and grasp its possibilities. Thus, before the arrival of the Americans, he had thought far ahead, well beyond the German capture of Alexandria, Cairo, and the Suez Canal—all of which was possible when he was halted at El Alamein in the late summer of 1942—to the eventual conquest of all of the rest of continental Africa, the invasion of India in possible concert with the Imperial Japanese Army, and a link-up with German forces in the Soviet Caucasus. Possession of all these territories and mineral resources would have kept the German armed forces afloat for the next several decades, but he could never convince Hitler and the high command of the correctness of his world view. To them, Russia was and remained the primary goal. Because of his being perceived within the officer corps as “Hitler’s favorite general,” Rommel had gained many enemies, and he became a defeatist as well after November 1942. He believed that all of Africa was lost the moment the first American GI stepped ashore in North Africa. He lost the command of German-occupied Italy in 1943 because he advocated surrendering all of Italy—including Rome—to the Allies without a fight, then making a stand in the Alps between Italy and Germany. Hitler balked and named Luftwaffe Field Marshal Albert Kesselring to command instead. Kesselring waged a successful fighting retreat up the “boot” for the next 18 months. Hindsight says Kesselring was a better choice. Following a one-day command of Greece on July 25, 1943, where Hitler feared an imminent Allied invasion, Rommel served as a sort of combined military adviser-consultant at Führer headquarters at Rastenberg until Hitler could find a new posting for his most famous—if defeated and defeatist—field marshal. 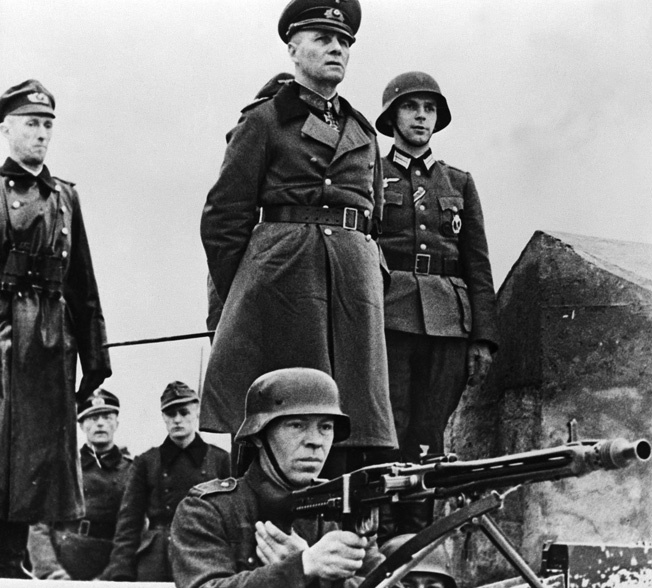 In the end, from November 1943 to July 1944, Rommel was posted as inspector general of the Atlantic Wall  and later commanding officer of Army Group B in France to prepare for the expected cross-Channel Allied invasion in the spring of 1944. “Rommel alone is worth the whole Atlantic Wall!” it was asserted, and in a very real propaganda and public relations sense that was, indeed, the case. While formidable—and he no doubt made it more so—in the final analylsis, the defenses were but a hollow linear shell with little depth. In fact, they were breached by the end of a single day and the Allies were ashore in force in Europe to stay. 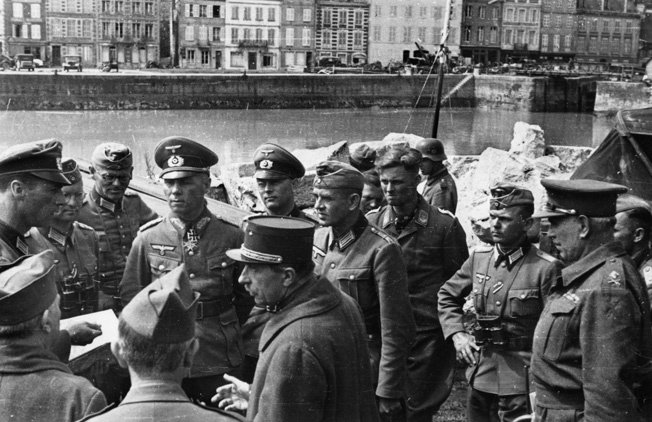 As head of Army Group B, Rommel was responsible for fortifying the French coast against invasion. Here he inspects German defenses in Normandy. After breakfasting at 6 am on June 4, 1944, Rommel left for Germany for a much-needed rest and a birthday party for Frau Rommel on the 6th of June—D-Day. Thus it was that the field marshal missed the start of the biggest military campaign of his career. He returned to the front later that day, but by then the Allies were already ashore in Normandy. Rommel’s future possible impact on the battle for France was further negated when, on July 17, 1944, while returning to La Roche-Guyon after a meeting with Josef “Sepp” Dietrich at 1st SS Panzer Corps headquarters, his open Horch staff car was strafed by an RCAF Spitfire near Livarot and crashed. Captain Helmuth Lang, who was riding in the car, reported, “Marshal Rommel, who at the start of the attack had hold of the handle of the door, was thrown out unconscious when the car turned over, and lay stretched out on the road about 20 yards behind it. A second aircraft flew over and tried to drop bombs on those who were lying on the ground.” Rommel was hospitalized for months with serious head injuries. He never returned to his command. Was Rommel a “Good German”? Rommel did or did not flirt with the idea of both removing the Führer from office and “opening up” the Western Front to the Allies to help bring this about. In either case, he would have been a traitor to his country by any standards, even given today’s moral—if incorrect—view that he was a “good German” who turned against Hitler in the end. The fact remains, however, that he supported Hitler and gratefully received a marshal’s baton from his hands when the Nazis were winning, then abandoned that cause a mere six months later when it was becoming apparent that the war was lost. In 1974, three decades after his death, the British revealed that they had been reading most of his radio traffic via their famed Ultra decryption program at Bletchley Park, an incalculable advantage, and one that must be factored in when assessing Rommel’s military successes and failures. What then, should history’s verdict be on Erwin Rommel? There is no doubt that he was a brilliant tactician and capable strategist, but also a wishy-washy politician who might have emerged from the lost war as president of the Reich had the July 20 plot succeeded and he had been given the opportunity. But these things did not happen, and the Field Marshal Rommel of myth, legend, and fact died a mysterious death and was given a hero’s funeral. We are left, therefore, with a chilling reality: he was no soldier of democracy at all, but the holder of an Imperial Iron Cross and Blue Max, then a Nazi Iron Cross, Knight’s Cross, and marshal’s baton. Had he been successful in North Africa, India, the Middle East, Normandy, and possibly even against the Red Army later, the capital of Nazi-occupied Europe would today be at Germania, the former Berlin, the Jews would have been completely wiped out by the triumphant Nazis, and a second, far more brutal Holocaust inaugurated against the combined Slavic peoples of the conquered East. First in 1950 in Brigadier Desmond Young’s ground-breaking biography Rommel: The Desert Fox, and then embellished upon in The Rommel Papers in 1953, the surviving members of the Rommel family and their political and military allies put forth the story that the late field marshal was compelled to commit suicide. This was done on the orders of Hitler and inspired by his alleged “rivals” in the high command of the armed forces, Field Marshal Wilhelm Keitel and Col. Gen. Alfred Jodl. The reason was his supposed involvement in the anti-Hitler bomb plot of July 20, 1944. Here is Field Marshal Keitel’s own first-hand account, written in his Nuremberg jail cell in 1946 while he was himself awaiting hanging, and published in 1979: “Rommel was heavily incriminated by the testimony of one of the main conspirators, a lieutenant colonel on the staff of the military governor of France, General Karl Heinrich von Stulpnagel. “The Führer showed me the protocol of the testimony and ordered the Chief of Army Personnel to summon Rommel to his presence; Rommel refused to come, as he was too ill to travel. Thereupon, the Führer ordered his chief adjutant and the Chief of Army Personnel, Wilhelm Burgdorf, to go and see him, taking with them the incriminating protocol and a letter which I wrote at Hitler’s dictation. 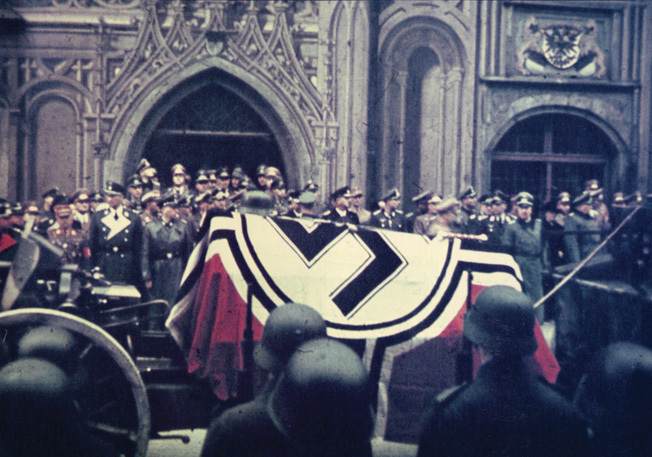 To disguise his role in Rommel’s forced suicide, Hitler gave the field marshal a lavish state funeral in Ulm on October 14, 1944. His helmet and marshal’s baton lay atop the flag-draped casket. After reading the protocol and the letter, Rommel asked whether the Führer was aware of the protocol’s existence. “Then he asked General Burgdorf for time to think. Burgdorf had personal orders from Hitler to prevent Rommel from committing suicide by shooting himself; he was to offer him poison, in order that the cause of death could be attributed to the brain damage he had suffered in the motor accident; that would be an honorable demise and would preserve his national reputation. “As they drove off together to the doctor in Ulm, Rommel swallowed the poison and died. The real cause of death was concealed, on Hitler’s express wish, and Rommel received a state funeral with full military honors.” Thus, it is seen that Rommel killed himself in this way because he was, in fact, guilty of treason against the state. In both the Young and Rommel Papers accounts, the argument is put forward that the field marshal elected death in order to save his family from harm by Hitler, but it should be pointed out that neither the widow of the actual would-be assassin of July 20, 1944—Colonel Count Claus Schenck von Stauffenberg—nor her three sons were killed (she was, however, sent to a prison camp and the sons were sent to an orphanage), and indeed, survived the war; so did Rommel’s wife and son.